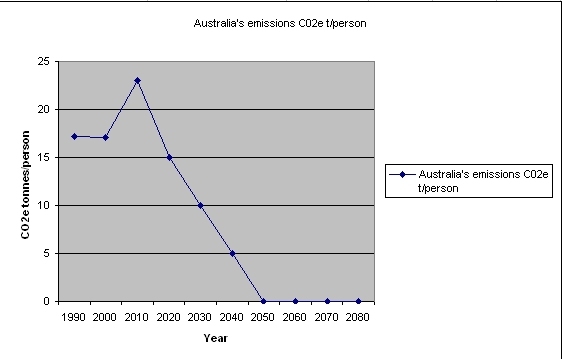 Australian emission reductions can be projected over time. The following graph illustrates an emission reduction profile to meet a zero carbon emissions target by 2050. Emission targets are specified as carbon dioxide equivalent tonnes per person (C02e t/person) which are a per-capita measure. The following table shows the actual emission reduction and their percentages. The projected C02e emission reductions can be contrasted with the historical emissions depicted in the graph below. India and Costa Rica have about one tenth of Australia's per capita emissions. This page was last modified 14:29, 21 June 2010.